Homemade ravioli (typical italian pasta) filled with meat. Gluten free, milk free, preservative free. 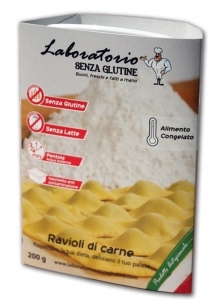 Our ravioli are made only with natural gluten free flour. Rice flour, eggs, pork sausage 18,5%, potato starch, rice starch, beef 6,1%, corn starch, onion, carrot, extra virgin olive oil, sangiovese (red wine), tomato puree, guar flour (E412).